Judy created Dynamic by Nature to serve as a welcome guide through the conflicting world of nutrition research and food choices, offering practical and insightful health programs, customized to fit your lifestyle and to empower you to live a happier and healthier life. Judy’s refreshing approach to nutrition is integrative, incorporating the multiple dimensions of wellness into her powerful therapeutic programs. She uses principles and assessment techniques from Traditional Chinese Medicine, along side a careful interpretation of modern Western science and a keen intuitive sensibility! Dispensing with conventional doctrine, Judy allows you to connect to a higher authority—your own body—showing you how to access and trust the wisdom your body has to offer, making a healthy nutritious lifestyle attainable and inspiring for you. Learn to connect to the wisdom of your body, in this comprehensive session with Judy Chambers she will investigate and assess your health imbalances, lifestyle habits and food choices. Empower yourself to thrive as you learn how to make intelligent, creative and practical nutrition choices that are attainable for you, with expert guidance and innovative strategies from Judy. Challenge yourself to make realistic changes as you co-create a daily nutrition and lifestyle program that takes you back to basics – nourishing whole foods, traditional therapeutics and restorative activities, all integrated with a modern spin. 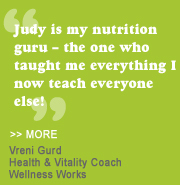 Judy makes a healthy lifestyle attainable, fun and inspiring. If you are out of town – not a problem – Judy offers on-line/phone consultations. Experience healthful cooking in an interactive cooking class that is sophisticated and delicious yet simple. Receive expert culinary tips from Judy and travel along with your taste-buds as she encourages an exploration of fresh, innovative tastes, using natural, whole foods and ingredients. Judy’s cooking classes also make a wonderful gift. For more information check out the classes section! Discover the secrets of super foods in super markets. Learn how to decipher complicated nutritional labels and choose foods that are whole, natural and healthy for yourself and your family. A passionate advocate for balanced, healthy living, Judy speaks on a variety of subjects including: Eating whats right for me, Simpifying Whole Foods… Nutrition is Fun (for Kids). Please contact Judy with questions. Book Judy for a private cooking class at your home. She is also available for menu planning and consulting. Imagine your kitchen supporting you in reaching your health goals. Imagine your kitchen loving you back. Imagine your nutritional needs being supported by a customized organizational system that can be easily maintained by you &/or your staff. Too busy with life and work? We have a solution to support your needs. The Integrated Kitchen is a no nonsense plan that eliminates all the ingredients and products in your kitchen that are a hindrance to your health and daily meal plan and restocks it with items that sustain your health. The first step beyond your personal nutritional map, which has been established by your consultation with a certified holistic nutritionist, is to create the ultimate environment to sustain the long-term change. Environment dictates results in the long run. By purging all unnecessary products in the kitchen that have been there for years we can help eliminate the pitfalls of going back to unhealthy patterns of eating. All items in the kitchen will be examined and removed, if they do not match or align with your nutritional map. No more guessing about what you should or should not eat! This service includes eco-friendly recycling of all glass and plastics. All unsuitable food products will be donated to a local food bank of your choice. Once all questionable items are removed from the entire kitchen the process of re-stocking can begin. Your fridge and cupboards will be supplied with only the foods that support your nutritional map. Each kitchen is provided with a master supply list that contains all products in the kitchen and indicates the location for each product. The supply list will also double as a shopping list for yourself &/or kitchen staff. Place the list on the fridge for easy of use or to reference. This last phase is ideal for the busy professional on the go. Let us prepare customized sauces, dips and dressings that are tailor made for you and placed in your freezer. Just defrost and it's delicious when you need it fast. Real foods at your finger tips... perfectly suited for your personal health goals. For more information: The Integrated Kitchen (PDF).